It takes individuals of strong strength of character and integrity to be put in a position of authority over thousands of persons monthly savings eked over years of hard work and, in many cases, through much sacrifice. In the wrong hands and without strict Integrity legislation this responsibility and trust money disappears instantly and becomes play money to be squandered in an instant. Hundreds of millions of dollars of peoples savings and indirectly insurance premiums were flushed down the toilet for property that was probably a small fraction of what it was really worth. Barbadians sick of the lack of accountability of the last pack of elected officials turned out to make a change in January 2008 based on the promise of a Ministerial code, ITAL and FOI. Only Barbadians can fix this problem and they must dig deep to understand why they continue to elect those who are not worthy to be elected but who continue to betray their trust and promises. Congratulations is certainly very much due here BFP. One would find it very difficult to beleive that the Fourth Estate in Barbados were unaware of the rotten and suppurate nature of Clico. Yet they have been silent as the graveyard at Westbury. 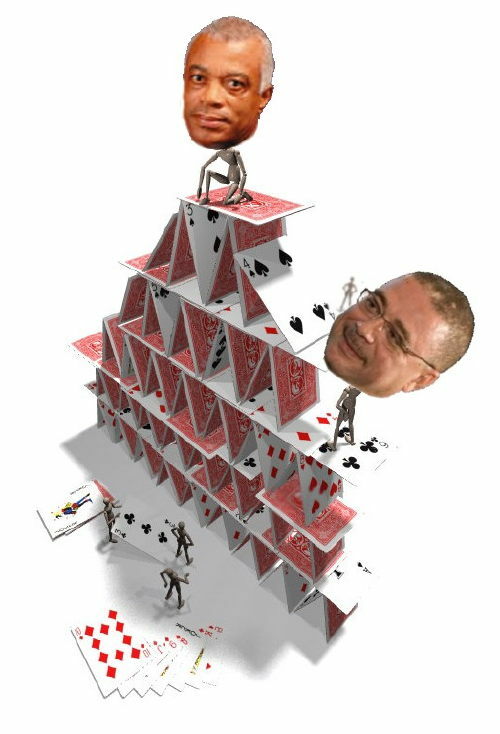 The shower of incompetent and perfidious scribblers at Fontabelle have failed repeatedly to serve their Bajan readership and the wider society other than with trivia, omissions, and downright untruths. They plumb the depths of utter disgrace. We have had our Prime Minister one David Thompson who travels by Clico luxury jet to Toronto and London to address Canadian and UK/Bajans but before he does so Clico is the warm up circus act flogging houses to the attended Bajan audience. This is the humiliating role that a Barbados Prime Minister is reduced to and in doing so he demeans us all. What a sad and woeful position, what a burden to attache to the shoulders of the Bajans who are proud of their heritage and acknowledge with deep pride those Bajan patriots the Clement Paynes, the Nanny Grigs, the Clennel Wickhams who sacrificed so much to build this special little place in the Caribbean. Over the past few weeks the world has been witness to an utterly extraordinary spectacle. It has taken a whistle blower at the heart of the government and the British Parliament with the active involvement of the British press to expose its rotten and corrupt state. All have been tainted, the government, the opposition, the Speaker and the House of Lords.It is a very British revolution that is unfolding presently. The peasants are revolting and British democracy will not ever be the same ever again. Lessons here certainly for Bajans and the somnolent non seeing, non hearing, ask no questions Bajan Fourth Estate. One can but hope. But there must always be the threat, that damoclean sword, that unrelenting spotlight trained constantly on those business folk, some who mean us financial harm and especially onto the politicians many who are easily corrupted who will sell their mothers, their children and their souls for seven pieces of stinking silver. We need a TFP Toronto. That can not be true, money does not disappear to ‘nowhere’ (unless your wife is taking it).. It belonged to thousands of small depositors and insurance clients. They were looking the other way because their silence had been bought. Maybe it was incredibly naive of the depositors to believe their government was protecting them from scam artists? If you can’t find the money then it disappeared to nowhere. This is very common in Barbados. Witness the money-pit known as Hotels & Resorts (GEMS Hotels). Government won’t say how many millions are gone, but the money is gone and disappeared. Happens all the time in Barbados. Just a question, what are the nationalities of the persons mentioned in the article? If the Stanford Bank is involved, that might be problematic! That’s why i don’t pay my premiums no more! i only pay 400 dollars! And i closing it down TOO! Another vanishing act has occurred. The Clico Barbados website has been taken down due to “construction”. Anyone who knows anything about running professional websites knows that taking down your website altogether without even leaving up any contact information is a huge ‘no no’. The question is, why would a company like Clico do this, especially at a time when many people need or want to get in touch with them? why is it that we are not hearing about the 2008 financials for clico insurance and clico mortgage and finance which should have been made public on or before april 30, 2009? Pingback: » PwC and Kingsland Abruptly Part Ways Keltruth Corp.: News Blog of Keltruth Corp. - Miami, Florida, USA.